10 February 2010, at 9:04a.m. US - Gainco, Inc. has introduced the new QAS quality inspection system for in-process inspection of poultry products to assure the processed products are conforming to exacting customer specifications. a paperless means for gathering inspection data. Gainco says the QAS quality assurance systems provide a paperless means for gathering inspection data of incoming, outgoing or work-in-process (W-I-P) product. The systems deliver significant improvements in speed and accuracy to the all-important quality inspection function at poultry processing facilities – while at the same time reducing the labour resources required for the process. With the QAS quality assurance system, weights are automatically captured and uploaded into the inspection computer. Dimensional and temperature inputs are captured via a computer touchscreen – so there is no need for paper logs. Productivity improvements of up to 50 per cent are attainable due to the elimination of unnecessary paperwork. The real-time data collection and reporting capabilities of the QAS system are noteworthy for their comprehensive and accurate capture of information 'as it happens'. Data is collected via computer touchscreens and calculated in real-time against the defined specifications of the processor's various customer and order parameters. Supervisors can monitor the networked inspection stations in real-time via an administrative PC, enabling them to know instantly the status of all quality inspections throughout the plant. If products fail a test or are out of spec, supervisors and operators are informed immediately via screen alerts and/or an automatic e-mail alert. Moreover, the QAS system's real-time reporting capabilities means that inspection reports are available immediately, as a test is completed – no more waiting to manually input data into a spreadsheet and calculate the numbers. With QAS, maintaining and managing paper files is a thing of the past, thereby eliminating paper storage and providing immediate access to customer queries. The QAS quality assurance system from Gainco is designed to be very user-friendly, and managed entirely by the customer. A quality supervisor or system administrator can configure new inspection tests and reports easily and effortlessly – without the need for special programming knowledge. Moreover, operators can interface with the system using graphical icons and multilingual capabilities. All data is available in spreadsheet format for timely feedback to internal or external suppliers or customers. A major attraction of QAS quality assurance systems is that they can be customised for the needs of any individual poultry processing plant. 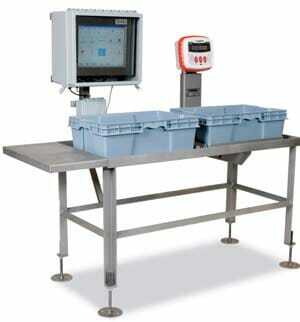 Systems can be configured to gather data such as kill date, arrival date and time, Julian code date, the supplier of raw product, bill of lading (including truck/trailer number), product temperature, piece count, defect incidence, as well as the label weight, actual weight, and calculated over- or under-weights (by box, tote or combo). In addition, the system is highly suited for in-house quality assurance checks such as piece weight and dimensional measurements, periodic yield monitoring for injection or batter/breading operations, and trim quality. Each QAS quality assurance system from Gainco is engineered to operate flawlessly in the harsh environment of poultry processing. The system's heavy-duty construction stands up to fluctuating hot/cold temperatures, humidity and daily high-pressure chemical wash-downs. All electronics and other key components are environmentally protected to increase parts longevity and reduce the need for maintenance. Moreover, the equipment's innovative frame design leaves no place for food debris and bacteria to hide or for water to collect, resulting in better sanitation and improved food safety. Another key operating feature of the QAS quality assurance system from Gainco is the DataMan® Data Collection System, a combined software/hardware solution that allows for the integration of all remote units on the production floor. Raw data can be made available throughout the plant network as well as across the corporate network. The data can also be moved to popular databases such as Oracle, SQL Server and DB2. The QAS quality inspection system from Gainco can be integrated easily and seamlessly into existing poultry processing operations. It was on display at Gainco Booth at the International Poultry Expo in Atlanta, Georgia, on 27 to 29 January 2010. For more information on the equipment, you may also contact Brian Porter at (800) 467-2828 or e-mail your request to info@gainco.com. QAS quality assurance systems from Gainco, Inc. improve real-time data collection and reporting, while increasing productivity and efficiency as well as virtually eliminating paperwork.